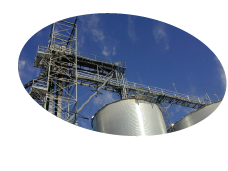 Opened in 2001, Golden Triangle Energy Cooperative (GTEC) produces ~20 million gallons of ethanol each year. In 2007, GTEC contracted long-time partner Bachelor Controls (BCI) to retrofit its obsolete control system with a newer, more flexible system to meet future production and product expansion needs. Bachelor Controls’ planning and preparation for the ethanol production control system conversion project was excellent. They clearly understood the tremendous amount of detail that was going be required for the project and the critical importance of implementing the new system during a single, scheduled shut-down. When it came time to execute, they were poised and ready to go. We knew the magnitude of the controls conversion project would be like a ‘heart transplant’ for our facility. We relied on Bachelor Controls to guide us in making the most effective decisions for our control system needs. We take great comfort in knowing our control system is designed to meet our specific needs, with replacement parts available locally. I don’t see how we could have done this project any other way.